With the Super Bowl and the entirety of the 2018 NFL season behind us now, it’s time to start looking in earnest at the 2019 fantasy football situations. The moves made over the next few weeks and months will determine who gets drafted higher than ever, who drops, and who emerges onto the scene. We don’t know what those moves will be yet. But we do know what we’d like to see. The moves below make some sense for the teams and players involved and would be among the most interesting options for the 2019 season. Will all of them happen? Of course not. But if they do, it’ll sure reverberate in the fantasy world. 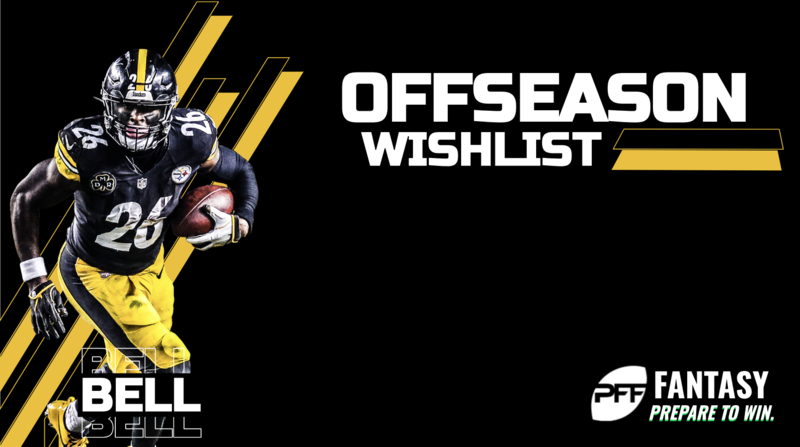 The (soon-to-be) ex-Steelers running back should have no shortage of suitors once he’s officially freed of the franchise tag and available to every interested team. Yes, our improving understanding of what positions are and are not important and the late-season surge of C.J. 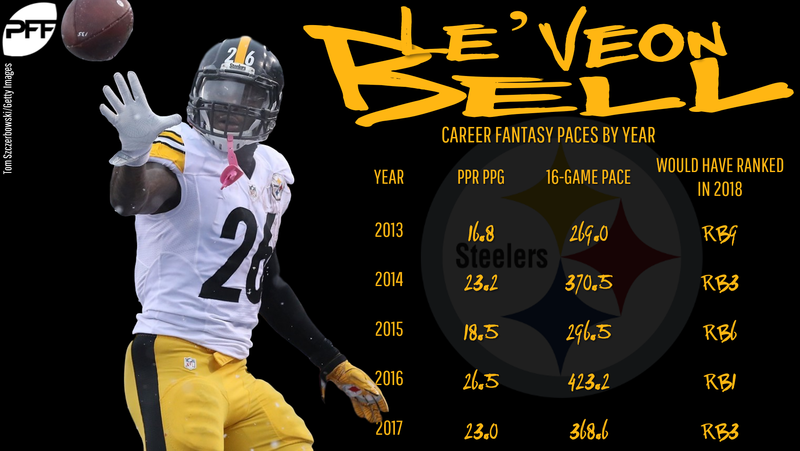 Anderson and many other factors combine to depress the value of running backs overall, but Bell is still going to get paid, even if he isn’t paid quite like he might have expected. Per OverTheCap, the six teams with the most cap space entering the offseason are the Colts, Jets, Bills, Browns, Raiders, and Texans. You could argue that the Browns are the only one of those six who shouldn’t at least make some phone calls about Bell. But with Marlon Mack coming on strong for the Colts, the Raiders needing an overhaul, and the Texans still having Lamar Miller on the books, none of those seems like a great fit. That leaves us with two AFC East teams in the Jets and Bills. The Bills could certainly use Bell, but if we’re just looking for the most fantasy-friendly landing spot, it’s the Jets. Bell and the Jets have been the logical pairing for at least a year now. New head coach Adam Gase has a history (before 2018) of leaning on one running back (from Knowshon Moreno to C.J. Anderson to Matt Forte to Jay Ajayi), and Bell is used to getting a dominant workload because nobody ever told the Steelers they’re allowed to use more than one running back. But the biggest reason to root for Bell in New York is the man under center. Sam Darnold had some serious highs and lows as a rookie, but what’s true is that, by PFF grades, he was the No. 1 quarterback in Weeks 15-16 and a top-five quarterback over the last half of the season. He did that with a dearth of weapons on offense. Give him Bell, acquire a receiver or two, and things start to get really promising for the young quarterback and the new head coach. When I helped my mother move a few years back, we cleaned out her medicine cabinet and found old bottles and tubes that had literally expired in the 1980s. Anyway, Eli Manning. There are rumors the Giants might bring Manning back in 2019, which would be a horrific mismanagement of resources at a time when the team has maybe the best running back/receiver combo in the league in Saquon Barkley and Odell Beckham Jr. The Giants should bring in Bridgewater, who might or might not still have the ceiling he hinted at in his Vikings days, and draft a quarterback like Dwayne Haskins or Kyler Murray early. If Bridgewater is Bridgewater again, the rookie gets a year to grow. If Bridgewater can’t get it back, you can start the rookie. Either way, you will be in better shape to make the best use of Barkley, Beckham, Evan Engram, and the offense than you would be with Manning’s calcified remains. What would it take for San Francisco to pry free the Steelers’ star receiver, if he is indeed on the market? Is there a price they could ask that would be too high? I mean, sure, but in practice, not really. Pairing Brown with a returning Jimmy Garoppolo and Jerick McKinnon, already-elite George Kittle, and the ascending Dante Pettis would immediately make the 49ers one of the toughest offenses in the league to combat. This is all based on outside-the-lines issues, which of course makes any conjecture more difficult. Will the Steelers let the problems outweigh the production? Will the 49ers accept the problems and make the most of them? There’s no way to know either one from where we sit. And if they do add him, there will be a crowded receivers room to work out. But those are all real-world problems. For fantasy, Antonio Brown in a Kyle Shanahan offense is just delightful. The Colts were competitive in 2018 well ahead of schedule, thanks in large part to Andrew Luck’s healthy return and a suddenly strong offensive line. The end result of that is the team is set up surprisingly well for the future — at least on offense. The Indianapolis defense exceeded expectations by even more than the offense in 2018, but a good chunk of the team’s ample cap space (most in the league) should be going to reinforcements on that side of the ball. On offense, the team has an elite tight end duo in Eric Ebron and Jack Doyle, a ridiculously affordable backfield behind that suddenly strong offensive line, and an excellent deep threat in T.Y. 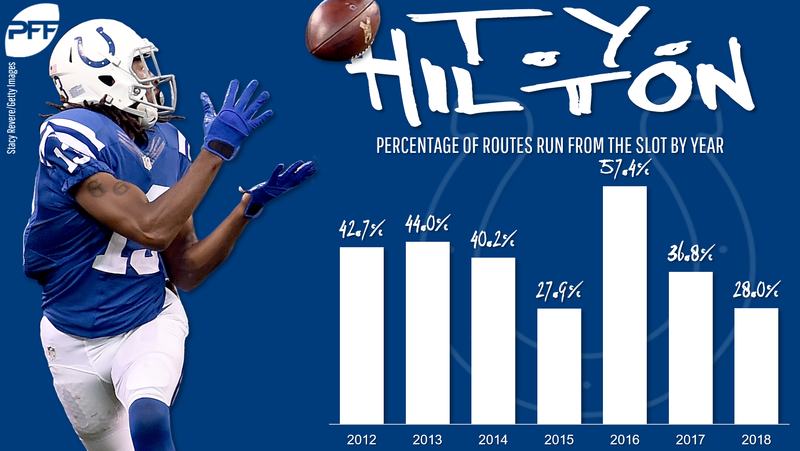 Hilton, whose time spent in the slot has been halved over the last two years. But the receiving corps after Hilton is a disappointing mix of castoffs and maybes, and the Colts can definitely afford to bring in a slot type. As a Colts fan, my preference is Humphries, who is five years younger than Tate and was under-the-radar better than him last year. But either guy (or Cole Beasley) would be a key step to helping the Colts build on their 2018 momentum. Cook picked the best possible time for his career year in 2018, heading into free agency as the best player on an awful team at a position with a serious dearth of elite performers. He is set up to capitalize on a market where I count a dozen teams that could use a pass-catching tight end, but if he’s interested in his best possible landing spot, you’d have to look at the Saints. Drew Brees made the most of Alvin Kamara and Michael Thomas in 2018, but his receiving options behind those two were underwhelming, to the extent that he was throwing touchdown passes to off-the-street signees like Garrett Griffin in the playoffs and the team was signing retreads like Dez Bryant and Brandon Marshall as emergency options. Enter Cook, who could fill a poor man’s version of the old Jimmy Graham role in the Brees passing game. The Saints have a shrinking window, just on the basis of Brees’ age, and could take advantage of Cook’s age (he turns 32 before next season) more than most of the other teams likely to be on the tight end market. The quarterback pressured on the highest percentage of his dropbacks in 2018? Deshaun Watson. The quarterback pressured on the highest percentage of his dropbacks in 2017? Deshaun Watson. The quarterback pressured on the second-highest percentage of his dropbacks in 2017? Tom Savage. 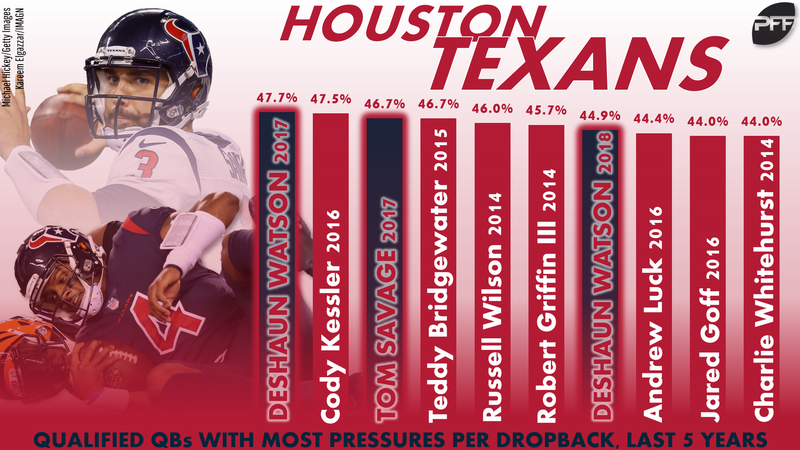 The Texans have a problem they’ve steadfastly refused to solve. That (and, sure, the secondary) should be top priority in 2019. The team needs to dive in on free agency (Rodger Saffold? Jared Veldheer? Ty Nsekhe?) and the draft, putting as many resources as they can justify into keeping Watson upright. The second-year quarterback exceeded my expectations in 2018 by staying healthy for all 16 games and closing the season hot, but don’t forget his midseason lull that accompanied a rib and lung injury that was severe enough that the team wasn’t even comfortable letting him fly to Jacksonville. Keep Watson healthy and you keep your ceiling high. Nobody is saying the Patriots’ run has to end here. But it remains true that, whenever it comes, the end of the Tom Brady/Bill Belichick/Julian Edelman/Rob Gronkowski era is getting closer all the time. The Patriots are in the bottom half of the league in available cap space, but they will get 2018 shoulda-been-rookie Isaiah Wynn back from injury in 2019 and have three picks in the first two rounds. That’s enough for the team to draft a quarterback early, a tight end slightly later, and sign a field-stretching free agent like Tyrell Williams. The Brady crew just won an underwhelming Super Bowl, and maybe they’ll do that again next year. But the team has been surprisingly steadfast in not preparing for the next step the last few years, and the time is here or very close. If Carolina wanted to be truly annoying, the signing would be a Mark Ingram or Tevin Coleman type to split work with Christian McCaffrey in 2019. But the far more fun-for-fantasy decision would be a second-tier guy like Yeldon. 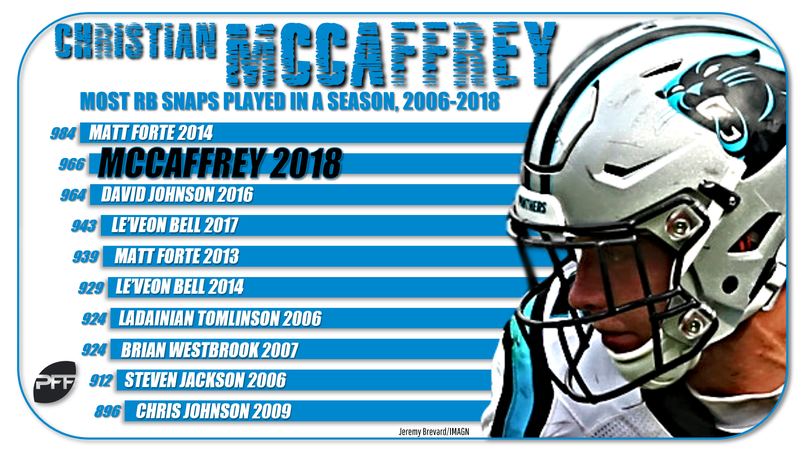 McCaffrey played a record-setting level of snaps in 2018, shattering every reasonable expectation for his workload. And while that could easily continue next season, one thing it should do is make every fantasy player nervous about his health. Enter a Yeldon type, a backup who could be called on to fill a full-time role if something were to happen to McCaffrey in 2019. The one downside to drafting McCaffrey super-early next season is there’s no insurance policy, no James Conner to McCaffrey’s Le’Veon Bell for those interested in handcuffing. But with a Yeldon (who was a top-10 PPR back over the season’s first month-plus with Leonard Fournette hurt) as a late-round handcuff and/or waiver claim in an emergency, some of the fear about McCaffrey can be relaxed.